Everest Base Camp Trek in January Doable? Home / 10 Best Treks in Nepal – The Ultimate Guide for Trekking in Nepal / Everest Base Camp Trek in 2018: The Ultimate Guide / Everest Base Camp Trek in January Doable? And the answer is a big “YES”. Everest Base Camp is not that populated in January. It is not the most attractive trekking season because of the holidays and the slight cold. But trekking to Everest Base Camp in January has its own benefits. Even in January, the daytime temperature in Everest Base Camp region is around 8-12 degree centigrade which is doable. And the temperatures during the nighttime are not extremely low either. So, there is no way that you can’t do it in January. The views of the mountains in the winter season are great. They’re glorious and you don’t get scenic views as clear as you get in this season any other time of the year. Nepal offers a great range of altitude for all trekkers. And Everest Base Camp is no different. Kathmandu itself lies at an altitude of 1400 meters, which itself acclimatized you some degree. When you get to Lukla from Kathmandu airport, you’ll be there at an elevation of 2800 meters. At the Base Camp, the elevation will be 5300 meters. And if you go to Kalapathar, which offers you the best view of Everest, you’ll get to an elevation of 5600 meters. Namche Bazaar, which has an elevation of 3441 meters. Gokyo Ri, at an altitude of 5483 meters. Although you might climb a great altitude while traveling Everest Base Camp, you don’t have to worry a great deal about the weather. The weather is predictable. There might be a big temperature difference between the daytime and nighttime, the changes are not unpredictable. There might be snowfall as well in January. This means that trekking poles will come in handy at this particular month. The nighttime temperature at the Everest Base Camp in January is between -5 to -12 degrees centigrade. This is not too low. To give you a perspective, even in the coldest nights in Kathmandu which can be 1-2 degree centigrade, people manage to feel warm and cozy with just a quilt. So with good mattresses and sleeping bags, you’ll feel pretty warm even in the nighttime. January cold means that gearing up plays a vital role. You should take care of your clothing as well as chargers as the solar charges might not have a great backup in January. Windproof and waterproof down jackets to keep the snow as well as the cold away. Inner T-shirts to go along with full-sleeve shirts. Windproof and waterproof trousers that will keep you warm even in climates where temperature goes below freezing point. Toiletries and first-aid box to deal with an emergency. Lip balms, sunscreen creams, winter gloves and hats, and a pair of warm socks for your skin and other parts that might not be covered by your clothing. Comfortable and capacious backpack will be required. As the Everest Base Camp trek is quite long, you need enough space to accommodate all the necessary belongings during the treks. A wonderful pair of trekking shoes is something that will make trekking pleasurable. Water and snow resistant shoes will come in handy. With not much trekkers trekking in January, there are various benefits of trekking in this month. Since this is the off-season, you won’t have problem hiring porters. Sometimes you might have to wait for a few days to catch a flight from Lukla to Kathmandu in months flooded by trekkers. In January, the tickets will be available in plenty. Only a few rooms will be occupied by people. So there will be plenty of spare mattresses and quilts to keep you warm. Solar charging will also be plentiful. During the months of October/ November where there is a high number of tourists, queueing up for charging can take a few hours. This is not a problem at all during January. The traffic of people who are trying to go to Everest Base Camp will be low. This might give you plenty of opportunities to take beautiful pictures of various places and mountains. As there won’t be many tourists, you can bargain for the prices they charge for their services. This means that some items might come at a cheaper price. But this doesn’t mean that everything is cheaper. Although January treks are not terribly difficult, there are various things that you have to consider in order to have a good January trek. In cold, your body burns more calories than it normally would. So you should keep up your food intake. Food rich in carbohydrate and protein should be considered. Keeping your food intake high and not letting your stomach feel empty is the key to rid the body of other altitude concerns. Keep the water intake high. Water is a great healer and also plays a significant role in keeping altitude sickness away. Avoid alcohol as alcohol makes your body dry and you might feel effects of dehydration. Maintain connection with your friends/ family and let them know your whereabouts. If you have a group, walk with them. They’ll give you support to keep moving in the long routes. There are a variety of travel options for people who want to trek in Nepal. If the weather in January seems too cold for you, you can try out the Helicopter tour to Everest Base Camp. That way you will save a lot of time and don’t have to go through an extensive trek. If you don’t think you will have enough time to complete the classic Everest Base Camp trek in January due to the lack of time, you can try the Everest Panorama trek. This trek will last 11 days and will give you plenty of time to get familiar with the Everest region. This trek will take you to Lukla, Phakding, Namche Bazaar as well as Tengboche. This short trek will give you splendid views of Mt. Everest, Mt. Lhotse, Mt. Thamserku, and Mt. Amadablam. This trip will give you a glimpse into the Sherpa lifestyle as well as culture. If you have plenty of time to get to many places in the Everest region, Gokyo Everest Base Camp trek is the one you should look forward to. 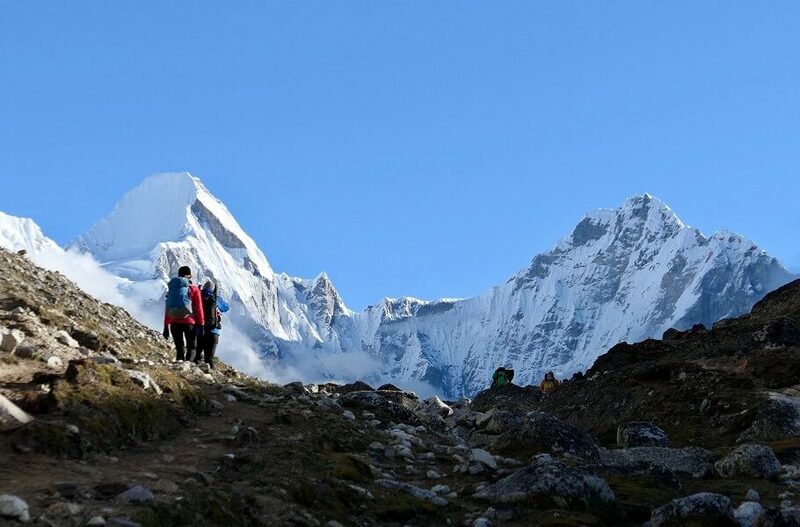 This trek which will last for 19 days will not only give you a chance to view the mountains, but also the mesmerizing water resources, culture as well as lifestyle in the Everest region. In addition to the Everest Base Camp, you will go to Gokyo valley. Gokyo Ri and Chola pass are other two wonderful places to go to in this trek. The impressive views of the Khumbu icefall and glacier will also be other things to look forward to in this trek. January trek is not difficult as some people make it sound. Yes, the cold might be a tad difficult to bear but the cold is not so extreme that trekking becomes impossible. There are a few adjustments to make. Perhaps, you have to spend an extra hour or two for acclimatization. You’ll have to sleep well and warm but the availability of many resources means that you can have all the privilege that is available. But, the trek is certainly doable and plenty of people have found this experience a lot better than trekking in seasons where people are trekking in plenty. Maybe you should try it too!